You know something I think is cute about humans in general? Our love for small things. Think about it! Even if we like the thing itself, we love the tiny version. A pig? Kinda gross. A tiny pig? Awww! A teacup? Classy. A tiny teacup? I need it right now! A house? Fine. A tiny house? Perfect! A cat or dog? Beautiful. A kitten or puppy? I want to die of happiness! Fun fact: psychologically, this obsession is a mix of what's called "baby schema" (certain characteristics that make our brains go "CUTE!" and push us to care-take) and our inner desire for control and simplicity. It doesn't matter how many times I see a kitten in a teacup. Every single time, I gasp and coo, "Kittyyy! Look, it's in a teacup! Aww, you're so cuuute!" And I do that for a solid minute. It's eternal sunshine of the silliest mind over here. Small pools, too, hit both those mental buttons for me. The mini-pool look is precious. They also clear out the potential mental clutter of bigger designs and heavier maintenance so that you can focus on what you want... a pool in your backyard. Not only do they combine the best of "cute" and "back to basics," but they're perfect for small backyards! For some people, it's the only way they can have a pool at all. We've installed pools where there was only an inch of leeway on either side. Talk about precision work. We consider small pools to be up to 26' long and up to 12' or 13' wide. Remember, if that sounds a little too small for your needs, you have other options that are still small-ish. Medium-sized pools run up to 36 ft. long by 14 ft. wide, and large pools are even bigger (obviously). On the whole, fiberglass pools don't get much bigger than 40 ft. by 16 ft.—they're transported to your backyard by highway and have to meet those sizing restrictions. Concrete pools and vinyl liner pools can be bigger and more customized because they're constructed right there in your backyard, but they take longer to build/install and it's a much messier process. Should your small pool have a freeform or linear style? Depends on your goals. 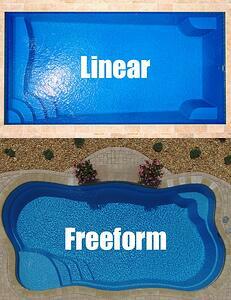 By definition, a freeform pool's curves cut into the open swim space. Linear pools provide maximum pool in that space. On the other hand, are you more interested in maximizing patio space for tables, chairs, and kids who have been put in time-out? Every foot counts. The blank spaces provided by freeform curves can provide the extra patio area you need. As a general rule, the average price of a standard fiberglass pool package is the length of the pool, times $1,000 dollars, plus $10,000 dollars. For example, a 20-ft. fiberglass pool package might cost $30,000. For obvious reasons, then, a small pool will cost less than a larger version of the same model/style produced by the same manufacturer. As with any other product, of course, pool prices vary based on area, manufacturer, pool model, material availability... The list goes on. But within the same style and manufacturer, smaller pools almost always cost less than bigger pools. Downsizing doesn't mean giving up what's important. Not only do small pools provide space for family play, but you also still have the elements that let you relax and hang out with friends and family. Bench seats and tanning ledges let you enjoy the water without having to stand or actively swim. As with the elements for socializing, you don't have to sacrifice the details that make your pool unique. Considering a fun water feature? That gorgeous waterfall fits just as perfectly on a 20-ft. pool as on a 40-ft. pool. Deck jets, cascades, waterline tile, pool lights... Check, check, check, aaaand check. Live your dream. Functional pool accessories like salt water chlorinators and heat pumps also work on any pool, regardless of size. More time for pool fun! Depending on the pool model and contractors, a small pool will generally cost less than a large pool. Like, thousands less. If your budget is tight, a small pool might be a good way for you to save without giving up anything. That money can go toward water features, a pool cover, or even just rainy-day maintenance savings. When space is limited, your option may be to have A) a small pool or B) no pool at all. For this reason, small pools are popular for vacation homes in places like Myrtle Beach. When former VP Joe Biden bought our Greco fiberglass pool, that was a tight fit in the yard. That model is 36 ft. long, so we'd classify it as a medium-size pool. If he'd wanted more deck space, he could've gone for an even smaller model. Short pools may not be the best option for pool owners who will use their pool primarily for swimming laps. There generally isn't enough open space for traditional laps. However, that's not to say you have no options! You can make it an "endless pool" by installing a jet-propulsion, propeller-powered, or paddlewheel system. They act like a pool treadmill, creating a current for you to swim against, so you don't need an Olympic-size pool to get an Olympic-size workout. You can also use a tether system and swim against your own resistance. Because there isn't enough length for a serious deep end, most small pools run relatively shallow. For example, the 24-ft. model in our D Series gets 5'3" deep, and our 20-ft. R model gets 4'4" deep. Compare that to their 40-ft. siblings, which go 6'6" deep. The downplayed deep end is actually great for family play, as games usually need players to be standing rather than treading water. Based near Richmond, VA, we at River Pools specialize in manufacturing and installing fiberglass pools both locally and across the country through our dealers. We're big advocates of fiberglass pools, and we manufacture and install our own line of designs...big and small, freeform and linear. Take our D Series and R Series fiberglass pool models, for example. We offer the big 40-ft-long options (D40 and R40)—and the smallest versions are literally half their size (D24, R20). The D Series retains its tanning ledge in both sizes, and two smaller bench seats combine into one long bench seat for the smaller size. The R20 doubles up on the long bench step off the stairs, so you don't lose sitting space there. It also combines the two deep-end bench seats into one to better suit the small size. Still have questions about inground swimming pools? If so, contact us directly or comment with your thoughts below! Next: Swimming Pool Design Guide: Friendly Advice from a Pro! Editor's note: This blog article was updated on November 5, 2018.